Nahki Wells scored a late winner as Huddersfield Town made it back-to-back Championship wins by beating Wolves. In a game of few chances, Terriers winger Jamie Paterson hit the post with a first-half shot. Wolves forward Joe Mason had one effort ruled out for offside and another deflected over after the break. But Wells capitalised on hesitant defending to fire home from close range, before Harry Bunn chipped over with a chance to double the lead. The defeat left Wolves marooned in mid-table and without a win in six games since beating Fulham 3-2 at Molineux last month, a victory which at the time was Kenny Jackett's side's fourth-straight league win. Huddersfield's victory - their 10th in the last 14 meetings with Wolves - followed last weekend's win at Nottingham Forest and lifted them to 15th in the table, 12 points clear of the relegation zone. Both sides only managed one shot on target each during a poor quality game. Wolves striker Bjorn Sigurdarson had a shot pushed away by Jed Steer, with Mason seeing his follow-up deflected over, before Wells tapped in at the far post for the only goal and his third in four games. "Everyone can be very proud of this performance. "Wolves made it very difficult for us, it was very tight and there wasn't much space but there was lots of hard work and we never gave up. "It is easy to play football if you are creating chances and scoring goals but when it is really tight you have to concentrate." "I don't think we deserved to lose. We battled and scrapped on a tough day and to get no points out of it is unfortunate. "Results are the bottom line and we didn't get a result today. We're not happy with losing a tight game, but there is effort and commitment there from the players. "You always want to be winning games. It was a close game and in the second half I thought we were the more likely to win it." Elvis Manu (Huddersfield Town) wins a free kick in the defensive half. Attempt missed. George Saville (Wolverhampton Wanderers) left footed shot from the centre of the box misses to the right following a corner. Corner, Wolverhampton Wanderers. Conceded by Mark Hudson. Attempt missed. Danny Batth (Wolverhampton Wanderers) header from the centre of the box misses to the right. Assisted by Rajiv van La Parra with a cross following a corner. Corner, Wolverhampton Wanderers. Conceded by Jonathan Hogg. Karim Matmour (Huddersfield Town) wins a free kick on the left wing. Corner, Huddersfield Town. Conceded by Matt Doherty. Attempt blocked. Karim Matmour (Huddersfield Town) right footed shot from outside the box is blocked. Assisted by Philip Billing. Foul by Elvis Manu (Huddersfield Town). Attempt missed. Harry Bunn (Huddersfield Town) right footed shot from outside the box is just a bit too high. Goal! 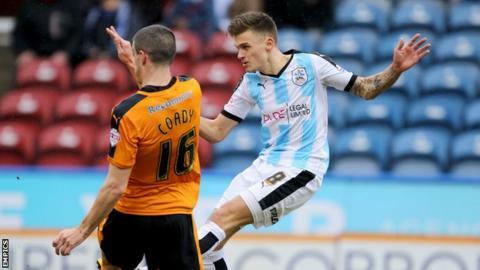 Huddersfield Town 1, Wolverhampton Wanderers 0. Nahki Wells (Huddersfield Town) left footed shot from very close range to the centre of the goal. Substitution, Wolverhampton Wanderers. Nathan Byrne replaces Tommy Rowe. Attempt missed. Karim Matmour (Huddersfield Town) right footed shot from the right side of the box is close, but misses to the left. Karim Matmour (Huddersfield Town) wins a free kick in the defensive half. Substitution, Huddersfield Town. Elvis Manu replaces Joe Lolley. Attempt blocked. Joe Mason (Wolverhampton Wanderers) left footed shot from the centre of the box is blocked. Attempt saved. Björn Sigurdarson (Wolverhampton Wanderers) left footed shot from outside the box is saved in the bottom right corner. Assisted by Dominic Iorfa. Offside, Wolverhampton Wanderers. Björn Sigurdarson tries a through ball, but Joe Mason is caught offside. George Saville (Wolverhampton Wanderers) is shown the yellow card. Delay in match Nahki Wells (Huddersfield Town) because of an injury.